'Mr. Church' sees the return of Eddie Murphy to the screen in a touching drama. Murphy has very rarely dabbled in dramatic roles, but his performance in this film shows that he should do so more often. He slips into this character seamlessly right from the beginning. 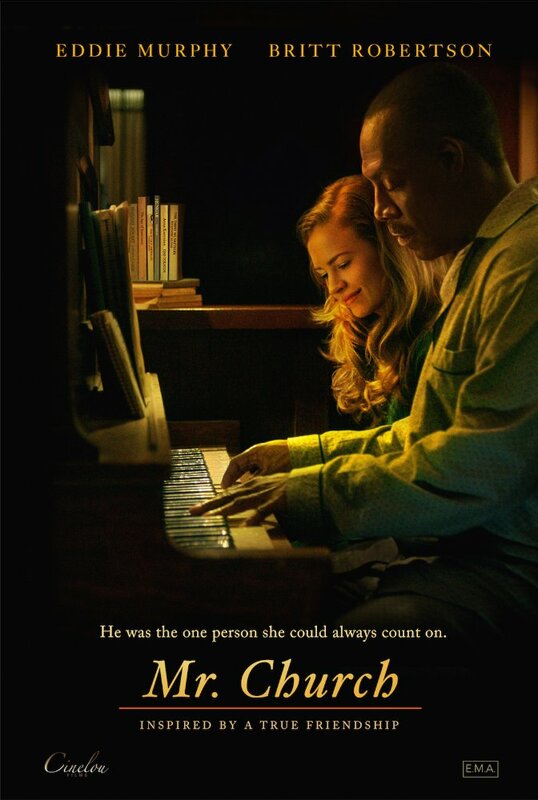 The whole story is told from the perspective of one girl whom we watch grow into adulthood with Mr. Church as a constant parent figure. The film plays as if it were based off of some writing (almost positively is) due to the time lapsing events and ever present narration. I'm not one for overuse of narration in a story unless it serves a specific purpose. While the disembodied voice of our main female does relate some information we could figure out visually on our own, her vocal presence works for this type of story. It helped to draw me in early on, when we start at a point where much catchup on details is needed. After the first couple of scenes the film finds it's footing and flows through a long timespan focusing completely on the enriching family-like friendship between Murphy and Robertson's characters. These two are endearing, which makes the many foreseen sappy moments hold some emotional weight. Each new turn of insight brings about a closer feeling of warmth and empathy. By the time we reach the end, any tears you may have are definitely earned. It was an overall delightful watch.